The Onyx Outdoor Muddy Waters Flooded Field Kennel Cover is insulated with ArcticShield Technology that protects the kennel from wind, rain, snow and the cold. 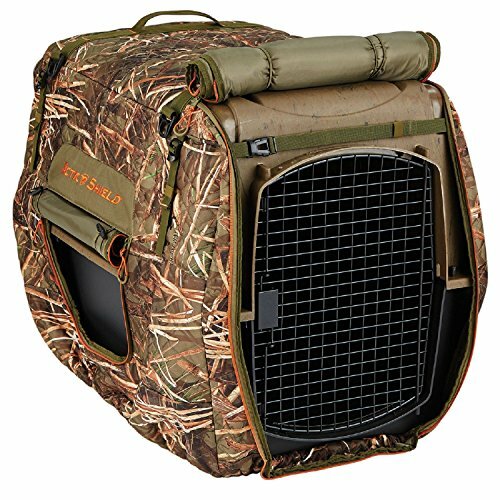 Top carry handles makes handling the kennel easy with the cover on. Take up straps tighten the fit to minimize any wind flap. Two side windows that are vented with zippered closures will roll up and secure with toggles/elastic loops. The main zippered door will roll up and secure with toggles/elastic loops. The open bottom design makes for easy on/off. There are three adjustable straps that secure the fit with quick detach buckles. Bottom hem has elastic cord to snug fit. The medium measures: 33.5-inches x 22.5-inches x 24.75-inches. If you have any questions about this product by Onyx Outdoor, contact us by completing and submitting the form below. If you are looking for a specif part number, please include it with your message.